COSTA MESA — The boating industry this year mourned the passing of two well-known innovators in multihull sailing design and construction — Gilbert Iwamoto and Rudy Choy. Iwamoto, owner of Gil’s Catamaran Boatyard on East 16th Street in Costa Mesa, died July 25, at age 90. Iwamoto had undergone surgery to remove brain fluid, but died of complications following a heart attack. A boat builder famous for his construction of fast, functional and innovative catamarans, Iwamoto continued to work at his boatyard even after becoming legally blind in his later years. Iwamoto, the second youngest of 10 children in a Japanese-American family, grew up in Hawaii, developing a strong work ethic at a young age. He was pulled from school to help take care of his mother, and at 8 years old, he was working in a pineapple cannery. Later, he worked in Pearl Harbor with his father on patrol torpedo boats, but realized the need to make the jump to the mainland in order to make a name for himself. “In 1955, he came to California with $300 in his pocket — and after a year-and-a-half, he bought his own yard,” Susan said. After settling in, Iwamoto moved his family from Kauai to the mainland and began earning a reputation as a skilled woodworker and boat craftsman. Within three years, Gil’s Catamaran Boatyard built and launched the first catamaran in Newport Harbor in 1958 — and since then, hundreds of boats have come through the small, yet efficient boatyard. Wayne Iwamoto, Gilbert’s oldest son and current owner of Gil’s Catamaran Boatyard, spent much of his childhood around his father’s boatyard, learning the craft of boat-building. “I learned his work ethic at a young age: Be on time, do it once and do it right,” Wayne said. Over the years, Iwamoto built custom yachts for many businesses and individuals. One day, he received a request to build a boat for a friend from his island days — Rudy Choy of C/S/K Catamarans. Choy, a Korean-Hawaiian known for his innovative racing catamaran designs, died Sept. 13 at age 88 — less than two months after Gilbert’s death. The two collaborated on some of the most famous catamarans of their time, developing many vessels together — some of which were used in Choy’s charter fleets, and some that competed in the Los Angeles-to-Honolulu Transpac Race. Like Iwamoto, Choy had found work hard to come by in Hawaii. But it was there that he developed a love of boating and found inspiration in traditional outrigger designs. Choy met boat designer Alfred Kumalea on the Big Island, and he taught Choy how to surf and sail. Following World War II, glider pilot and aerodynamicist Woody Brown came to Hawaii, and he became fascinated by the unique outrigger-type sailboats of Micronesia. “The three of them came up with the idea of the modern (multihull) sailboat,” said Barry Choy, Rudy’s son and now-owner of Choy Design. At first, Barry said his father was almost “tagging along” with Brown and Kumalea in the world of boat building and design, but he picked up the concepts quickly. By 1947, the trio had developed the first modern multihull — Manu Kai — and Choy believed that catamarans were the future of boat design. In 1954, Choy crossed the Pacific with friend Woody Brown aboard the catamaran Waikiki Surf, attempting to show Transpacific Yacht Club’s Transpac Race committee the capabilities of catamarans — and gain admission into the race. While he was denied entry that year, Waikiki Surf showed the potential of catamarans and the future of offshore sailing. Choy was drawn to Southern California’s openness to new catamaran designs. Here, the Kauai-born innovator would develop boats that differed from the traditional catamaran concepts of Hawaii. In 1957, with Kumalea and Warren Seaman, Choy formed C/S/K Catamarans. The partnership, joined by Vince Bartolone in the early 1960s, was responsible for some of the fastest and most innovative catamarans ever created. C/S/K was based in Venice Beach until 1969, when Choy became homesick for the islands. After a recession hit the boating industry in California, Choy moved back to Hawaii. He started a beach catamaran business and designed one of the first dinner-cruise tour boats — Aikane II — which ended up being the last C/S/K-designed catamaran built. When Choy decided to have another boat constructed in 1970, he went to Gil’s Catamaran Boatyard, beginning a long and productive relationship with Iwamoto. The first catamaran to come out of the collaboration was the 68-foot Aikane III. Over the years, Iwamoto built many of the catamarans used in Choy’s charter boat fleet, including construction of two 94-foot catamarans from 1978 to 1979. Barry began sailing with his father at age 4, spending most of his days in the boatyard while his friends played baseball. Similar to Wayne Iwamoto’s youth, Barry’s growing-up years were immersed in sailboat design and construction. By age 15, he was designing catamarans. While Rudy Choy and Gilbert Iwamoto collaborated on many projects, they did not always agree. “They were both very good at what they did, and both were extreme in their thinking,” Wayne said. Barry explained their relationship further: “Both Gilbert and my dad were rebels. They didn’t believe or try to conform to conventional wisdom, and they would often take the opposite view. They both had a belief in catamarans — the idea of getting away from the conventional idea of a single-hull boat. “They were both content to toil off in their own corner of the boating world. They didn’t need the affirmation,” Barry said. While both Gilbert Iwamoto and Rudy Choy maintained a traditional or “old-school” style of business, it was their openness to innovation and technology that moved their collaboration to new boating heights. During the 1950s, Gilbert Iwamoto was one of many Japanese-born boat builders coming out of Hawaii. But many specialized in the traditional techniques of the craft, using old-world methods from the late 1800s and early 1900s without utilizing new technology. 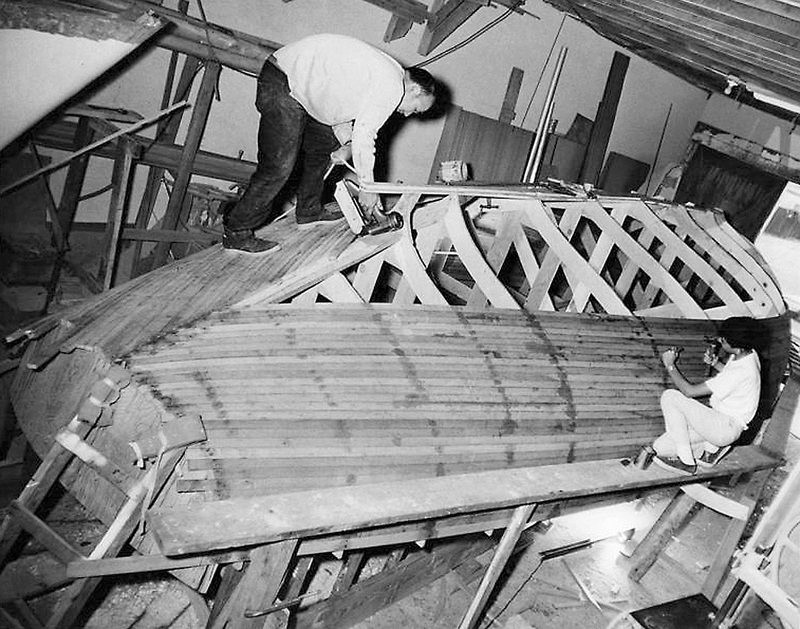 Gilbert Iwamoto’s acceptance of new boat-building techniques, along with his knowledge of traditional style, produced a unique combination that Rudy Choy respected. Gilbert Iwamoto is survived by his son, Wayne, and two younger children: Carol, 55, and David, 50. Gilbert Iwamoto’s wife, Grace, died in 2008 at age 88, after she and Gilbert had been married more than 60 years. Rudy Choy is survived by his daughter, Robin, and his son, Barry.